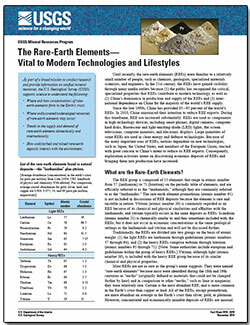 The Mineral Resources Program publishes fact sheets on selected important commodities. 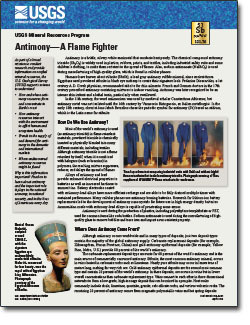 These fact sheets teach about commodities and the important role each one plays in the national economy, national security, and lives of Americans every day. 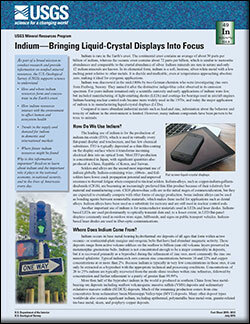 Mercer, C.N., 2015, Indium—Bringing liquid-crystal displays into focus: U.S. Geological Survey Fact Sheet 2015-3012, 2 p., http://dx.doi.org/10.3133/fs20153012. 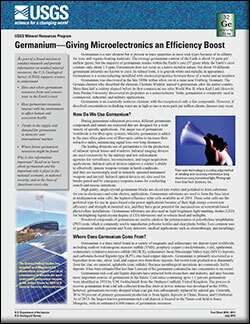 Mercer, C.N., 2015, Germanium—Giving microelectronics an efficiency boost: U.S. Geological Survey Fact Sheet 2015–3011, 2 p., http://dx.doi.org/10.3133/fs20153011. 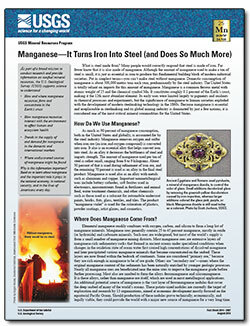 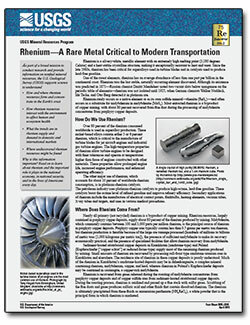 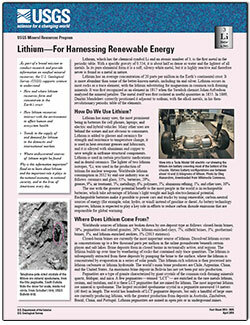 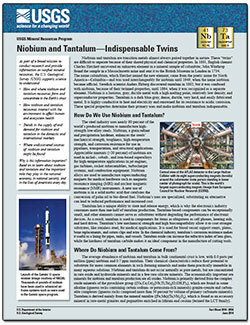 John, David, 2015, Rhenium—A rare metal critical to modern transportation: U.S. Geological Survey Fact Sheet 2014–3101, 2 p., http://dx.doi.org/10.3133/fs20143101. 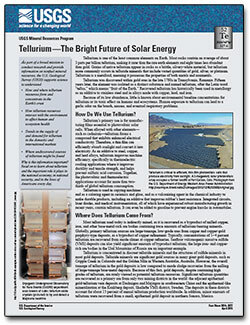 Goldfarb, Richard, 2015, Tellurium—The bright future of solar energy: U.S. Geological Survey Fact Sheet 2014–3077, 2 p., http://dx.doi.org/10.3133/fs20143077. 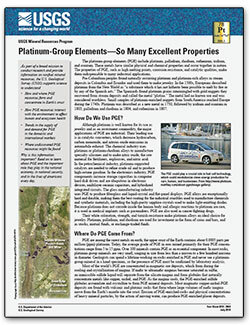 Zientek, Michael L.; Loferski, Patricia J.
Platinum-group elements: so many excellent properties; 2014; FS; 2014-3064; Zientek, Michael L.; Loferski, Patricia J.
Bradley, Dwight; Jaskula, Brian W.
Foley, Nora; Jaskula, Brian W.